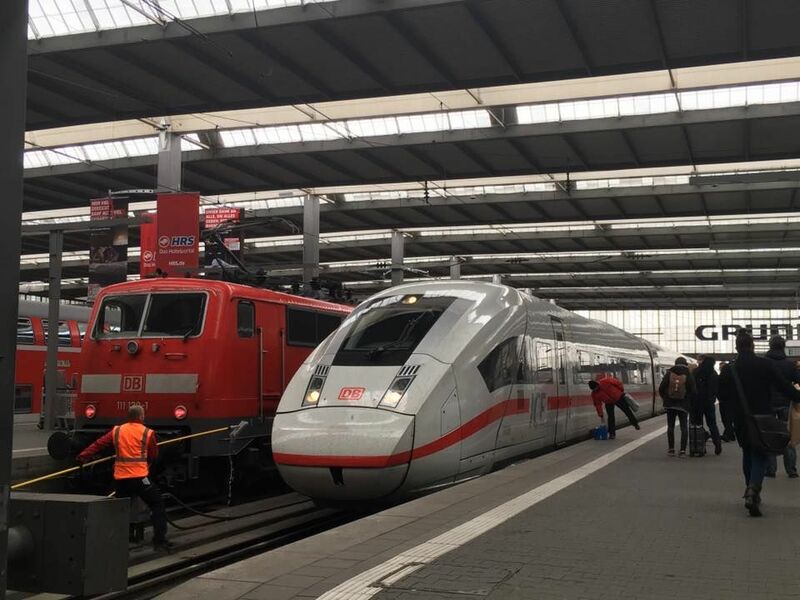 The very newest generation of German InterCityExpress ICE trains, the ICE4 built by Siemens, seen here just after having arrived to München. Picture 17.4.2017 by Timo Varshukov. Two of the new ones "kissing". The Br 407 or Siemens Velaro D is a 320 km/h fast electric multiple unit, which by the DB is marketed as "neuer ICE3", new ICE 3, athough there are also two other older trains known by the same name ICE 3. These new ones were built 2009-2012, but came into real service only fully in 2014. It is a 200,7 m long train, which is capable of running not only within Germany, but also on routes for example to Paris in France. 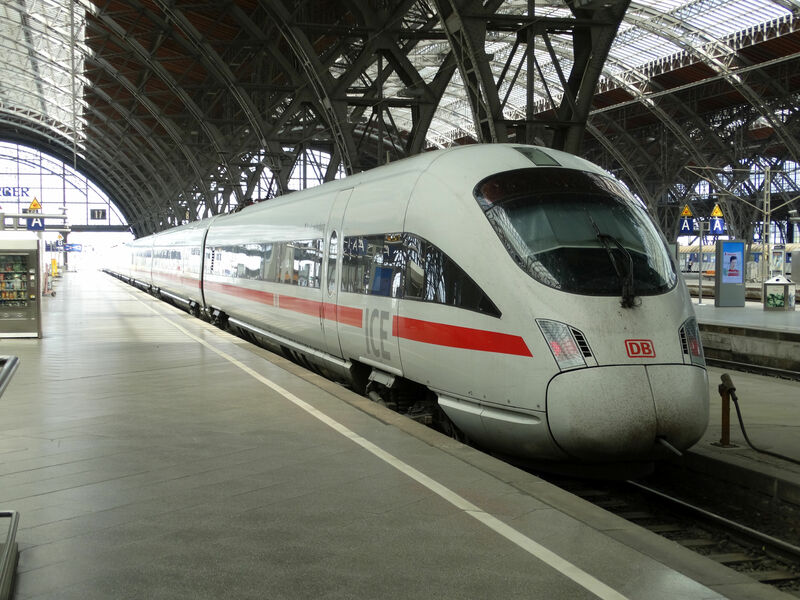 Picture at Frankfurt am Main Flughafenbahnhof 14.9.2016 by Ilkka Siissalo. Another class 407 Siemens Velaro D. Picture at Stuttgart Hauptbahnhof 8.7.2015 by Ilkka Siissalo. 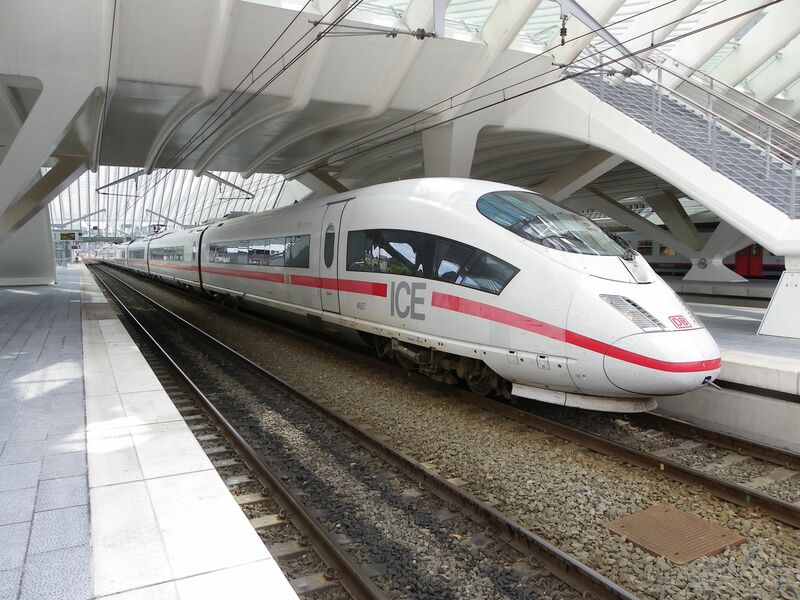 The DB class 406 or ICE 3M (M stands for multiple electric systems) trains are a more modern version of the third generation of ICE trains and they are used especially on the Germany to Paris, France services. This is a German DB class 406 on its way from Paris to somewhere in Germany stopping at the Liége (Lüttich) station in Belgium. Picture 10.7.2015 by Ilkka Siissalo. The same DB ICE 3M leaving Liége towards Germany. The poor beautiful train has suffered from an awful graffiti attack on the side of the second coach from rear and there's also some ugly smudge at the rear front. Picture 10.7.2015 by Ilkka Siissalo. The first generation of the ICE trains was a 14 wagons long rake with a specifically designed locomotive with just one driver's cab at both ends. It was designated Br 401. 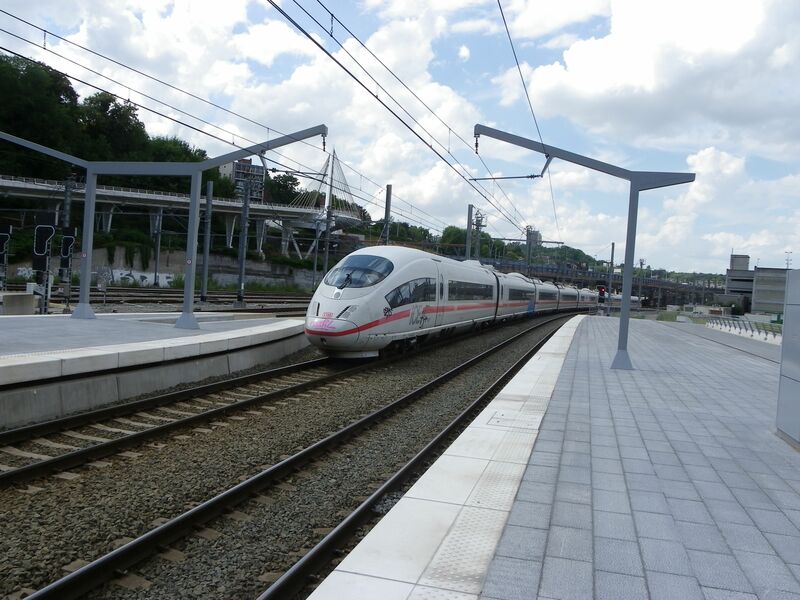 This is a Br 401 train in full speed by Amstetten at the Geislinger Steige. Picture 8.7.2015 by Ilkka Siissalo. 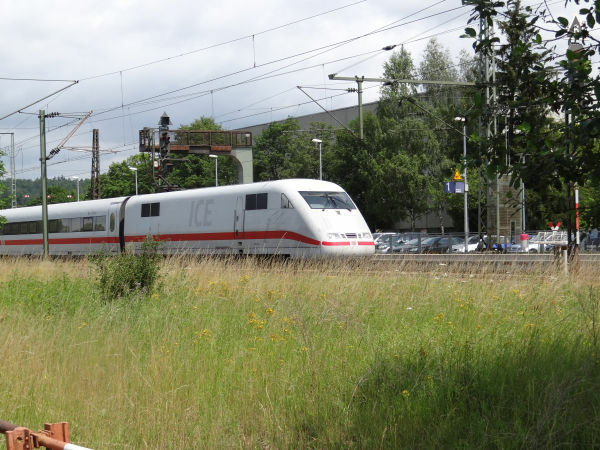 A first generation ICE, Br401, in full speed passing the station of Lüneburg. Picture 17.7.2018 by Ilkka Siissalo. 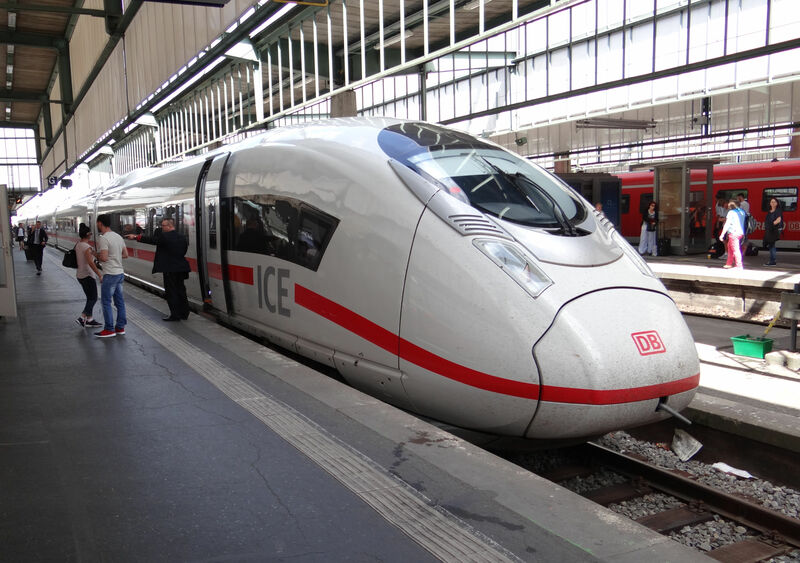 This is an ICE-T train of the class Br411. 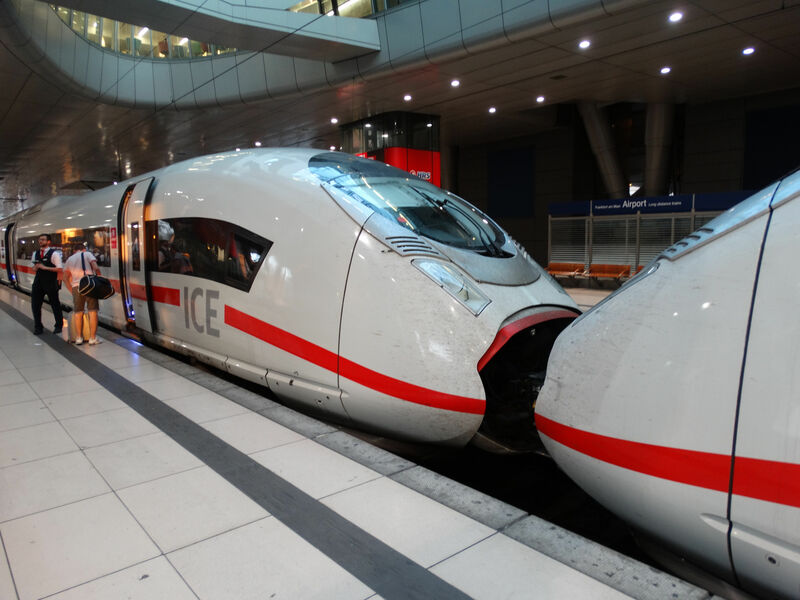 Deutsche Bahn let develop tilting electric multiple unit trains with ICE level comfort for curvy, old fashioned train lines especially in the former East German parts of the country, where track quality often was not on the same level as in the west. ICE-T trains were produced by a consortium including Siemens, Düwag and Fiat Ferroviaria. Fiat brought in its tilting train technology from its well known Pendolino models. ICE-T trains come in two classes (Baureihe): Br415 is five coaches long and Br411 is seven coaches long. 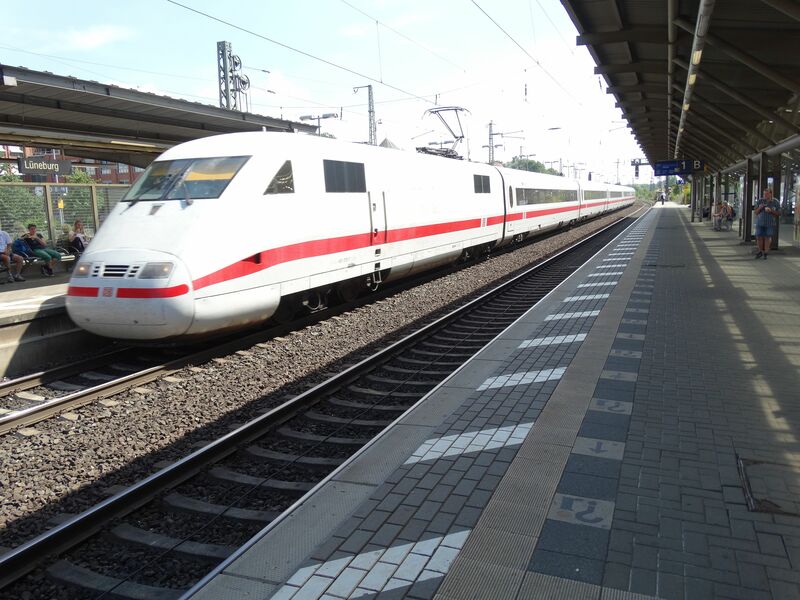 This one is a Br411, here ready to soon leave from Leipzig to Berlin. Picture from Leipzig Hbf 16.7.2018 by Ilkka Siissalo.